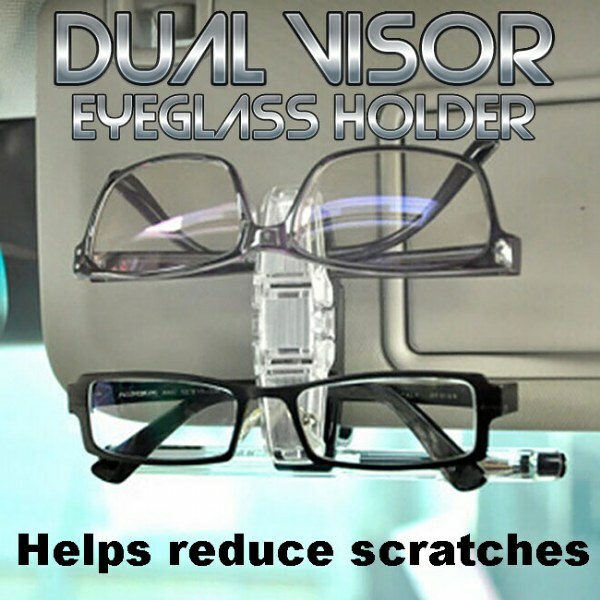 Dual Visor Eyeglass Holder finally keeps your eyeglasses, or even sunglasses, within reach while driving. Dual Visor Eyeglass Holder finally keeps your eyeglasses, or even sunglasses, within reach while driving. This secure clips securely slides on your visor without obscuring your vision. For personal preferences, the visor can even rotate up to 90°. Helps reduce scratches on your lens, and makes it super convenient to grab your glasses when the lighting gets dim and harder to see, or if the sun suddenly blinds you while driving. Provides safe and convenient storage for two pairs of glasses. Package includes one dual clip.